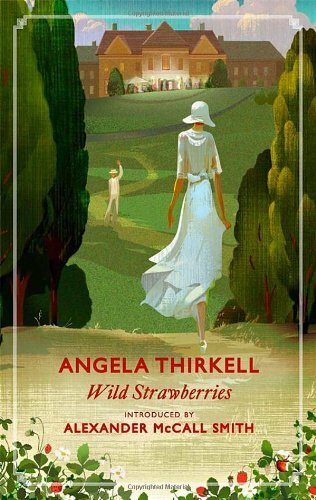 I read my first book by Angela Thirkell, High Rising, about four years ago and thoroughly enjoyed it. I had a lot of trouble finding any other books by her, though, so didn't get to any further in her series. Luckily, though, I am now part of a large library system and I was able to find the second book in the series, Wild Strawberries. As far as I know, Wild Strawberries does not have any of the same characters as High Rising, but it has been four years since I read the previous book, so it's possible that I just don't know. This story is set in a Barsetshire country house, where the Leslies make their home. The eldest son in the family was killed in World War I, and Lady Emily and her husband have not quite recovered. But it's the Roaring 20s and the younger set is happy, optimistic and bright, as many wealthy young people often are. Mary Preston comes to stay as a companion for Lady Emily, and we hear most of the story from her point of view. Much like High Rising, this book was high on wit and humor, and pretty light on character development and plot. Mary was naive and silly, though her elaborate imaginings about saving her love from a fire or nobly stepping aside so that another woman could be happy were fun to read. We didn't get to know the hero very well at all, though we were assured throughout the novel that he was a very kind, intelligent, and thoughtful man. I think I was turned against John fairly early, though, because he said a horribly racist thing in a quite off-hand manner. And YES, I get the whole "Oh, Aarti, everyone was racist in the 20s! Don't hold it against them!" thing (a comment that I find extremely offensive, so please don't say it to me). But it's hard to give your heart and soul to a character in a book when he makes it so plain that he considers you beneath him. What Thirkell excels at is in pointing out the foibles and inconsistencies of the British upper class with gentle irony. One of the characters decides that he is a French royalist, but we find out a bit later that in previous years, he thought himself a Bolshevik, a Communist and all sorts of other things, so we know not to take him too seriously. Another character, David, kind of wants a job, but he just can't take himself seriously enough to find one. And then there are the women, all so vague and unaware of their surroundings that you can't help but think they must be addicted to laudanum or something. This was a fun and light read (except for the racist bit), and while I don't think the characters were as realistic as I'd like, and the plot was pretty shaky, it was a good way to unwind after a tough day at work. Recommended for fans of Wodehouse.